Have you been to the Chicago Flower Show? Which Garden Shows have you been to, if you don’t mind sharing? And have you ever attended the Chicago Garden Show held in March at the Navy Pier? Reason I ask, is I read some not so pleasant reviews about the Chicago Flower Show – and just wondered, if you have attended, did you find it of value, could you rate it or give some insight to what it was like – and what to expect? 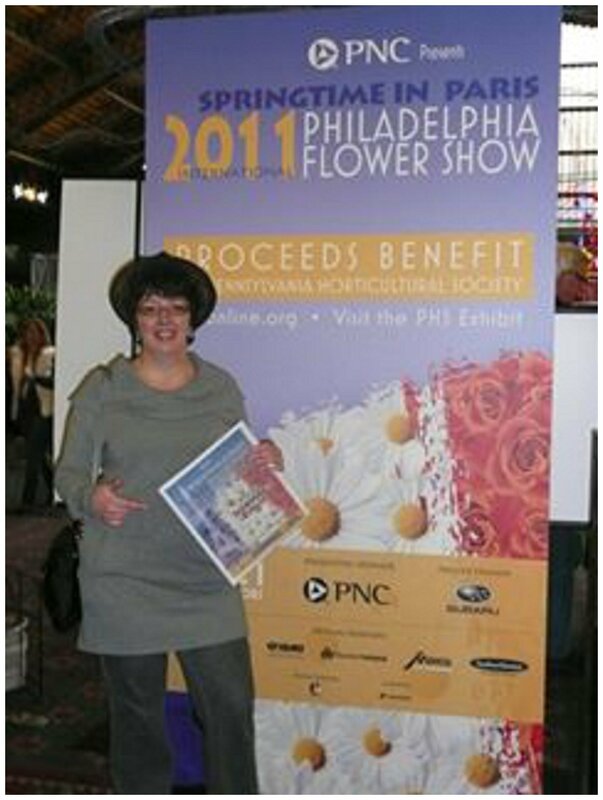 Philadelphia Flower Show – HUGE – I spent two days each time attending, and stayed in an adjacent hotel – perfect! This show is spectacular but tiring – on your feet for hours with thousands of people (so if you don’t like huge crowds, forget it), but a super treat if you don’t mind hours of viewing with tons of passionate fellow gardeners (check out the Man Cave at the show there if you go – rest your feet and watch t.v. guys!). My hubby took me to this show, and and we make it an adventure – taking the train from home, and visiting other local attractions in Philly. Fortunately, the train stops in a town next to us – so, we didn’t mind the journey from here to Philly at all – it was fun. The Philadelphia Flower Show entrance always amazes me – there are moments at that show I will never forget – huge, gigantic aw-inspiring displays and a HUGE wine tasting event – everything is absolutely grand at this one. To see my post in 2012 of my visit to this show, themed tropical and Hawaiian style, click HERE. Love going to the Philadelphia Flower Show when I can! Photo from my 2011 Visit to the show. The Hartford, CT show – known as the “CT Flower and Garden Show” – Of course, I can not miss this one – it is in my area, and I know some of the speakers, and take my gardening friends along. It is very nice, and well-done, like it – but no where as big as Philly – one of the largest in the world I believe, so to compare the two – well, that’s not appropriate, but I would recommend this show to anyone. It has speakers each show day on an upper level above the show floor exhibits – all free presentations, and very nice landscape displays with a balance of vendors. So it is not too commercially oriented, and offers a great deal to see and enjoy in the middle of February. Many Connecticut nurseries showcase there, and there are restaurants in town to enjoy along with other features in Hartford, CT (e.g., The CT Science Center in downtown Hartford, CT). To see a post about my visit to this show, well, you know – click HERE. Rhode Island Flower Show – It is held the same time period in February as the CT Flower and Garden Show – and that kind of irritates me! Of course, you could do one and head to the other, but still, I just wish they weren’t on the same exact dates. Still haven’t been to this one. It’s on my list however. Boston Flower Show – I’ve attended this one three times, once via bus with a group of CT hort people, and twice with a friend. It was loads of fun cause its held in a CITY and the food choices at nearby downtown restaurants are wonderful (if you go, check out Boston Legal Seafood “Harborside” where you can sit at tables facing the water – food is outstanding). The Boston Flower Show is bigger than Hartford’s show, and has a very nice balance of plant related displays as well as garden related vendors. It’s a keeper, especially when you can book a hotel room which is walking distance to the event so you can go back and forth to unload you fun gardening purchases. To see my post when I visited this show in 2013, click HERE. BUT WHAT ABOUT CHICAGO’s SHOW – DO YOU RECOMMEND IT??? Anyhow, my intent was to get some specific feedback on the Chicago show – If you have attended, what did you think of it – how would you compare it in regards to size, etc.? Did it offer plenty of plant related displays and information, or was it more commercially oriented – like having things non-related to gardening and plants? In the windy city – gosh, it can be very cold in winter – so to trek out there – for me would require a flight, hotel, and all that blues music in surrounding venues – thus, interested VERY MUCH in your feedback – Comment Away!! Thank you! P.S. The show in Seattle, WA looks AMAZING, titled the Northwest Flowers & Garden Show. I fell in love with their FB posts on it last year, their seminar topics were incredibly well done and seemed in sync with the current gardening trends and times, BUT talk about far for moi to travel to do that one — It is across the country for me from Connecticut, but heck – side trip to Hawaii?? 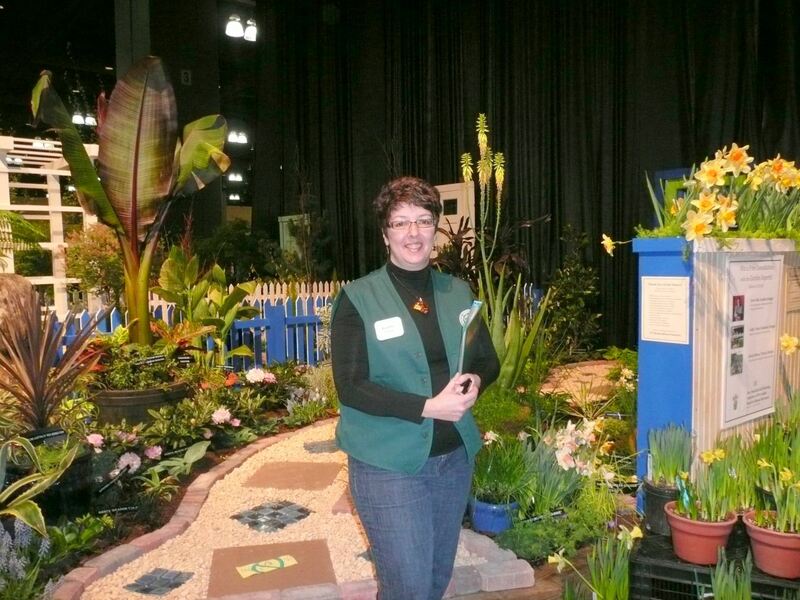 Me in 2010 at the CT Flower Show as a CT Hort Society Volunteer. Don’t you just love the green vest? Their display has won several awards. I love the big red banana plant in the left corner in a container garden (Ensete)! Cathy, sorry I can’t help. I’ve only been to Chicago once, and it was November, frigid and windy. It lived up to its nickname.We have an annual event in Charlotte which is fun, but nothing I think like Chicago and Philadelphia. The only flower show I’ve ever been to is the CT Flower and Garden Show! LOVE IT!